Since Ankara cannot integrate the Russian-made system with NATO radars, the Turkish government will have to find a way to effectively protect the country against high-tech missiles. Turkey's recent deal with Russia to purchase the S-400 missile defense system is a crucial step toward diversifying the country's options, but the Russian-made system is not the ultimate answer for Ankara as it needs to rely on indigenous technologies to be fully prepared for threats, defense industry experts told Daily Sabah. 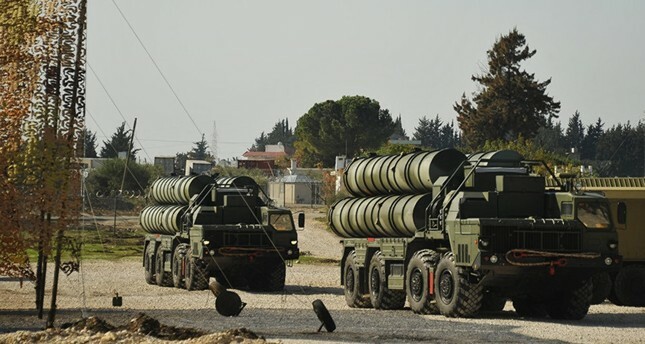 President Recep Tayyip Erdoğan broke the news last week regarding the purchase of the S-400 systems saying, "Talks [with Russia] have pretty much ended," though most details of the agreement still remain unknown. Meanwhile, questions loom in Ankara about whether the S-400 system is the key to Ankara's expectations and needs. Another question circling in the minds of the Turkish public is whether Turkey will transfer the technology from Russia or jointly produce the S-400 system. On the other hand, whether the two countries actually signed the agreement or simply agreed to sign has confused media outlets and the public. Despite Ankara claiming that the deal is nearly finalized, the CEO of the Russian defense exporting company Rosoboron export said the deal could be signed by the end of 2017. While the Russian media portrays the agreement solely as the purchase of the missile defense system rather than a technology transfer or joint production, Turkish Presidential Spokesman İbrahim Kalın said last week that Russians gave the go ahead to transfer the technology. "One of our most important gains in the S-400 deal is that it will not only fulfill Turkey's security needs, but it will make it possible to transfer the technology," Presidential Spokesperson Kalın said in a televised interview. Experts, however, remain skeptical. Arda Mevlütoğlu, a prominent defense industry expert, said the S-400 missile defense system is a significant step but will fall short of protecting Turkish soil against ballistic missiles and cruise missiles if certain requirements are not fulfilled. "S-400 has its own radar system, but when it functions on its own, its effectiveness diminishes. What can be done? Different radars can also be bought also from Russia, for example," Mevlütoğlu said. The main problem with the S-400 system for Ankara seems to be the NATO issue. Since Ankara cannot integrate the Russian-made system with NATO radars, the Turkish government will have to find a way to effectively protect the country against high-tech missiles. Another defense expert, Turan Oğuz, suggests the probability of the S-400 system to stop ballistic and cruise missiles is close to zero when it functions with its own radar system. "If you want to stop ballistic missiles, another radar network with an effective observation system is needed," Oğuz said, adding that there are two options for Ankara. "Ordering it from Russia and paying double the money or developing it indigenously. That, however, would take at least five or six years," Oğuz contended. Mevlütoğlu voiced the same idea, saying that Turkey could either develop a parallel air defense system or buy different radars from Russia. That being said, both experts doubted that Ankara would pay Russia double or triple for the radars. Regarding how Turkey can effectively detect ballistic and cruise missiles, Oğuz stressed that Turkey has been able to do it thanks to U.S. satellites as part of NATO. "However, it is not possible with the S-400 system," he affirmed. Turkey has a way out of this dilemma as well: An indigenous satellite to detect every type of missile. However, Oğuz claimed such an indigenous satellite could not be realized until 2025 or 2026 if the project were to start now. Despite the gloomy atmosphere regarding the incapability of the S-400 system when it comes to cruise and ballistic missiles without specific radar systems, Mevlütoğlu emphasized that the purchase of the S-400 system is, indeed, a vital move to diversify Turkey's options and be aware of threats to some extent. "S-400 is definitely a positive step toward increasing the number of options Turkey has, but we cannot use the system to its full capacity because Turkey lacks the necessary technology," Oğuz said. In spite of Turkey's current lack of relevant technology, there are ongoing efforts to turn the tide. After a protracted bidding battle to supply Turkey with Turkish Long Range Air and Missile Defense Systems (T-LORAMIDS) – a Turkish long-range air defense missile system – Turkish leadership made the decision to launch its own project to build the system. In line with Turkey's determination to pursue a comprehensive program of the indigenization of its armed forces and building cutting edge competencies, Turkey is investing in its native advanced arms manufacturers, such as Aselsan and Roketsan, to produce short and medium range missiles and electronic systems for the military. Turkish defense companies are already producing short and middle range ballistic missiles, such as the J-600T Yıldırım (Thunderbolt), SOM Cruise Missile and a laser guided "Cirit" missile, but are not yet capable of producing long-range missile systems. Furthermore, Turkey conducted its first successful test of its 280-kilometer-range (175-mile-range) Bora missile in May. The Undersecretariat of Defense Industries has been working on the project since 2009, and Turkish defense contractor Roketsan has been charged with the development and production of the missile system. Amid Turkey's increasing cooperation with Russia, both in Syria and the purchase of the missile defense system, Washington has expressed some concerns. Speaking to Daily Sabah, Pentagon spokesperson Johnny Michael said: "Turkey has not purchased the Russian system. We have an open dialog with them on this issue. We have concerns about the purchasing of the S-400 systems, which we have relayed to the government of Turkey. We emphasize the importance of maintaining inter-operability with the NATO system on any major defense systems procurement." Michael stressed that Washington is ready to expedite the delivery of the equipment ordered by Turkey at any time, saying: "The United States and Turkey have a robust and significant defense trade and military sales relationship. The United States is committed to expediting the delivery of equipment purchased by Turkey, when possible." While Turkey exerts effort to diversify its options regarding the air defense system, former Defense Minister Fikri Işık announced earlier in July that Turkish companies and Eurosam will work together to produce SAMP/T Aster 30 long-range surface-to-air missile (SAM) systems, which are already in use in several NATO member countries. The SAMP/T Aster 30 system uses a network of sophisticated radars and sensors — including 3D phased array radar — enabling it to be highly effective against all types of air threats. The system can intercept missiles with a 600-kilometer range and can operate in standalone mode or integrated in a coordinated network, such as NATO's missiles defense system.